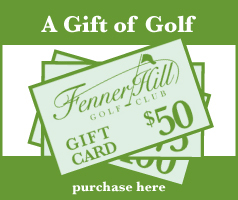 Welcome to Fenner Hill Golf Course, one of Rhode Island’s most inviting semi-private golf courses. Located in rural Hope Valley, Fenner Hill Golf Club offers a pleasurable golf experience for players of all abilities by promoting the PGA’s “Tee It Forward” initiative with a new set of tees for the high handicapper or someone new to the game. This links style course is situated on Rt. 3 off Exit2 of Rt. 95, 15 minutes north of Mystic, Conn. or 15 minutes south of West Warwick, Rhode Island. While playing, one is surrounded by panoramic views, generous fairways, 17th century stonewalls, and the unspoiled woodlands of Southwestern Rhode Island. The clubhouse features a well-stocked Pro Shop and a fantastic restaurant, Fenner Hill Bar & Grille. Whether sitting down for a meal, grabbing a quick bite, or just stopping in for a drink, our restaurant’s expansive menu can meet your needs. Relax as you sit in the restaurant or take advantage of our expansive deck overlooking the golf course. Fenner Hill is becoming a “hot spot” for private and corporate functions. Our banquet facility seats up to 150 people, and our hospitable staff ensures a memorable experience. Spend a day in a relaxed atmosphere and take home a piece of Fenner Hill’s New England charm. We held my daughter’s wedding shower her this past weekend and it could not have been any better. The chef was amazing and produced great food. The service was perfect and the coordinator couldn’t have been nicer. You would be remiss to overlook this venue for any event or for just dining at the Grille. Go go go… You will not be disappointed.